TORONTO (Nov. 21, 2018) – The National Hockey League Players’ Association (NHLPA) and Kids Help Phone are proud to officially announce a three-year partnership, with a strong focus on community engagement and educating youth in Canada. This collaboration began with the 2017-18 hockey season and will continue through the 2019-20 season. Together, the NHLPA and Kids Help Phone are working to educate youth across the country about the importance of mental health and well-being, while drawing awareness to Kids Help Phone/ Jeunesse J’écoute’s life changing and saving services and resources. As a part of Kids Help Phone’s Giving Tuesday campaign Nov. 27, the NHLPA has pledged philanthropic support as the Matching Donor. Funds were raised for Kids Help Phone in partnership with the NHLPA’s 26th annual Charity Golf Classic. The total impact of the NHLPA’s matching donation to Kids Help Phone will be announced following Giving Tuesday. The partnership is highlighted by content featuring NHLPA members on important topics related to mental health and well-being. During the 2017-18 hockey season, a first series of articles were published, featuring Patrice Bergeron, Erik Gudbranson, Zach Hyman and Zack Smith. This season’s features will again focus on topics relatable to both NHLPA members, families and youth nationwide, such as finding and following your passion; balancing friends and family; being a team player while managing competitiveness; and dealing with expectations. 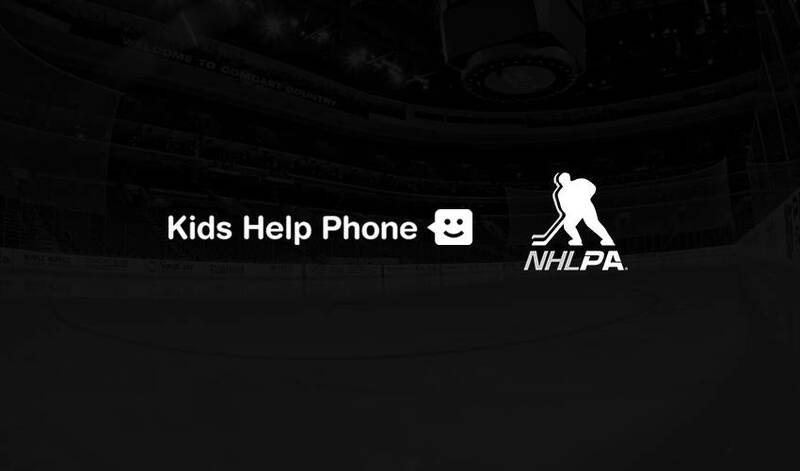 For the first of this year’s five-part monthly series of articles – launching today on kidshelpphone.ca and NHLPA.com – NHLPA members Jake Gardiner and Travis Hamonic discuss the importance of giving back to your community. Kids Help Phone is Canada’s only 24/7 national service offering professional counselling, information, referrals and volunteer-led text-based support for young people. Kids Help Phone’s free, anonymous services are available in both English and French. Kids Help Phone is a registered Canadian charity, and raises the majority of revenue from individuals, foundations, corporations, and community fundraising.